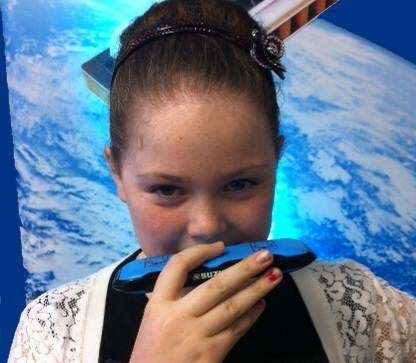 If you think learning the harmonica would be a popular activity at your school, please get in touch. We will explain how Harp Academy operates in other schools, review lesson space and times, and help target a start date. We will also run through Harp Academy’s safety management system with you, including our DBS, public liability insurance, risk assessment, safeguarding, child protection policy, and first aid certification. Lesson format – daytime or after school? 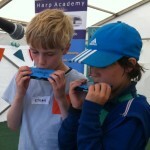 Harp Academy works with children from Pre-School up to Year 6 (4-11 yrs). Sessions take place during the school day, or as a music club at lunchtime or after school. 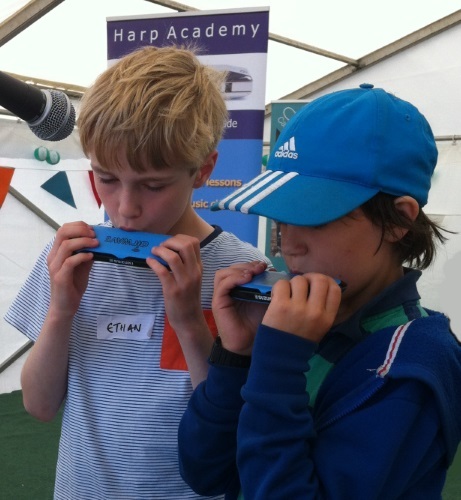 Harmonica lessons are 30 minutes long and we teach small groups of 6-7 children daytime, or up to 10 children for lunchtime and after school clubs. In line with other independent music services, we provide 10 sessions each term (that’s 30 sessions each academic year). Let us know whether your Reception Year children will be eligible to join too, or if we should wait a term or so for them to find their feet. Harp Academy works with local Pre-School Nursery groups, so we teach 4 and 5 year old children too. We are also happy to arrange whole class teaching for you, on an ‘access to music’, or ‘music-makers’ basis (below). Budgets are an important issue for everyone. Before parents subscribe in full for our small group or club sessions, we provide a free taster session for anyone who would like to try things out. This includes a free starter harmonica and music sheet. Ongoing lessons are £18.75 monthly, or £64.35 for the first 10 week term, £71.50 per 10 week term thereafter, which is a third the price of private music learning. 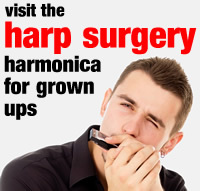 The only other cost is a one-off payment of £19.99 for each child’s harmonica music pack, however parents are free to supply their own kit (folder, diary, 10 hole harmonica). Children keep their music packs and bring them to each lesson; instruments are not hired or borrowed. Depending on group sizes, children can join at any point during our 10 week schedule. When you are satisfied that we meet all your School’s safety and good practice criteria, it’s time to arrange a 15-20 minute harmonica demonstration in assembly. This can be a whole-school assembly, or split KS assemblies. We will play to the children as they arrive, and again as they leave for classes. 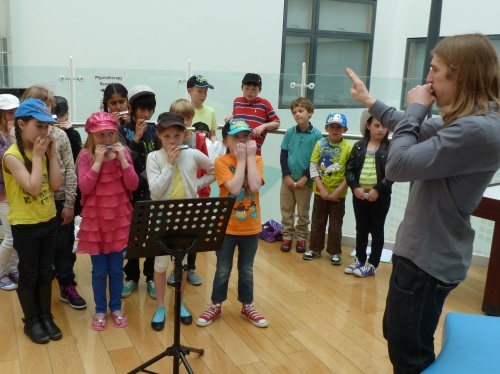 During the assembly, we will explain how the harmonica works in an entertaining format, and invite one or two children to try it for themselves. There will normally be time for questions at the end of the demonstration and there is no cost to the school for our presentation. We will supply promotional flyers to take home, explaining what we do and how parents can register their interest on line. If you have a paper-free school policy, or an alternative recruitment system, let us know in advance so that we can plan accordingly. Within a week we will let you know the level of response. If there is none, we’re all done, and the children will have had an enjoyable and educational assembly! If we achieve the minimum uptake of 6 children, we are ready to get our first group underway. Ideally we would look to launch at least an hour of teaching on site, with two or more back to back half hour sessions (split into KS or year groups). Registration, payment and other admin is organised directly between Harp Academy and parents, so there is no extra burden on your school office team. We will forward a copy of our register to you at school, so that you know which children are involved. We will also introduce ourselves to your office team so they know who we are and and have the opportunity to ask any questions. We’re happy to talk to class teachers and meet with parents also. When would you like to launch Harp Academy? Are you considering daytime teaching or an after school club? What is the target group (Reception, KS1, KS2)? Is there potential for teaching back-to-back half hour slots (eg. KS1/KS2 or Y3-4/Y5-6)? What are your School’s health and safety requirements? Is there a cost for room hire? Can we arrange assembly playbacks from time to time? Can harmonica parents attend assembly playbacks? Do you need references from other Harp Academy schools? Can we be included in school newsletters and on the school website? Can we feature in the school’s activities or clubs information? 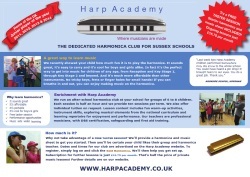 Can we display Harp Academy flyers and posters in school? Can we deliver a demo assembly twice a year to maintain interest levels? As an alternative to our small group scenario, we can run 45 minute sessions once a week for an agreed period each term; usually 10 weeks. These can be tailored to children’s Key Stage needs and we are happy to work with a number of classes on the same day. The guide price for each whole class lesson is £50.00 per hour pro rata, which is invoiced to the School and payable within two weeks of our final session. Typically we will provide one starter harmonica per child. The equipment cost for 4 hole Speedy starter harmonicas is approximately £4.50 per child (inc VAT); 10 hole models can be supplied for approximately £8.00 per child (inc VAT). Schools would usually recover the instrument from parental donations or funding, and VAT can normally be reclaimed. 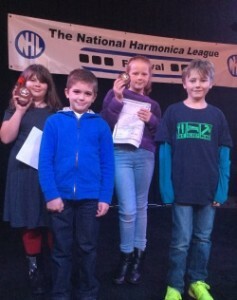 From time to time, individual children outgrow their group, but are keen to continue learning the harmonica. We also offer private half hourly 1:1 sessions on site, in order to feed this interest. 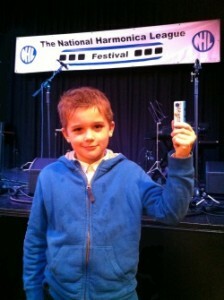 This might be something you’d like to consider as part of the harmonica mix at your School. Musicians Union teaching rates apply.